Astronomers have discovered a mysterious planet-like body in the distant reaches of the solar system. March 15, 2004: NASA-funded researchers have discovered the most distant object orbiting the sun. It's a mysterious planet-like body three times farther from Earth than Pluto. "The sun appears so small from that distance that you could completely block it out with the head of a pin," said Dr. Mike Brown, California Institute of Technology (Caltech), Pasadena, Calif., associate professor of planetary astronomy and leader of the research team. The object, called Sedna for the Inuit goddess of the ocean, is 13 billion kilometers (8 billion miles) away, in the farthest reaches of the solar system. 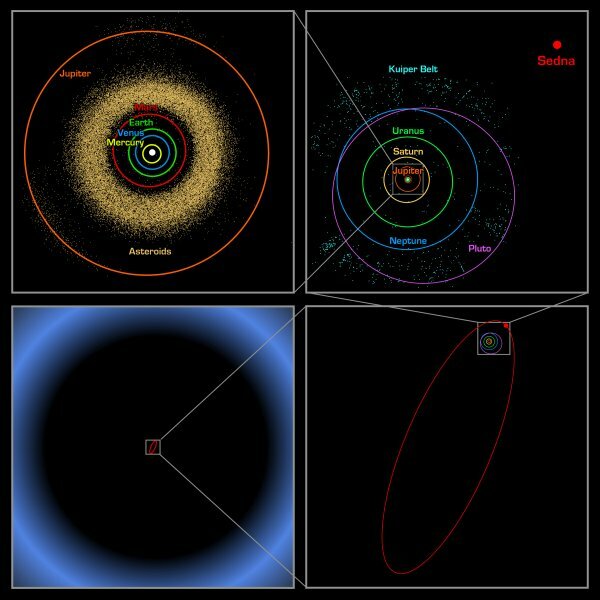 Above: An artist's rendition shows the newly discovered planet-like object, dubbed "Sedna," in relation to other bodies in the Solar System, including Earth and its Moon, Pluto, and Quaoar. This is likely the first detection of the long-hypothesized "Oort cloud," a faraway repository of small icy bodies that supplies the comets that streak by Earth. Other notable features of Sedna include its size and reddish color. After Mars, it is the second reddest object in the solar system. 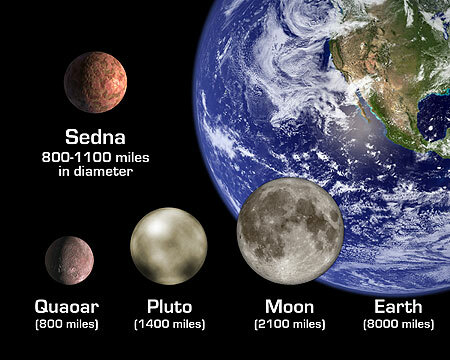 It is estimated Sedna is approximately three- fourths the size of Pluto. Sedna is likely the largest object found in the solar system since Pluto was discovered in 1930. Brown, along with Drs. Chad Trujillo of the Gemini Observatory, Hawaii, and David Rabinowitz of Yale University, New Haven, Conn., found the planet-like object, or planetoid, on Nov. 14, 2003. The researchers used the 48-inch Samuel Oschin Telescope at Caltech's Palomar Observatory near San Diego. Within days, telescopes in Chile, Spain, Arizona and Hawaii observed the object. NASA's new Spitzer Space Telescope also looked for it. Sedna is extremely far from the sun, in the coldest known region of our solar system, where temperatures never rise above minus 240 degrees Celsius (minus 400 degrees Fahrenheit). The planetoid is usually even colder, because it approaches the sun only briefly during its 10,500- year solar orbit. At its most distant, Sedna is 130 billion kilometers (84 billion miles) from the sun, which is 900 times Earth's solar distance. Scientists used the fact that even the Spitzer telescope was unable to detect the heat of the extremely distant, cold object to determine it must be less than 1,700 kilometers (about 1,000 miles) in diameter, which is smaller than Pluto. By combining available data, Brown estimated Sedna's size at about halfway between Pluto and Quaoar, a smaller planetoid discovered by the same team in 2002. The elliptical orbit of Sedna is unlike anything previously seen by astronomers. It resembles the orbits of objects predicted to lie in the hypothetical Oort cloud--a distant reservoir of comets. But Sedna is 10 times closer than the predicted distance of the Oort cloud. Brown speculated that this "inner Oort cloud" might have been formed billions of years ago when a rogue star passed by the sun, nudging some of the comet-like bodies inward. "The star would have been close enough to be brighter than the full moon, and it would have been visible in the daytime sky for 20,000 years," Brown explained. Worse, it would have dislodged comets farther out in the Oort cloud, leading to an intense comet shower that could have wiped out some or all forms of life that existed on Earth at the time. Rabinowitz said there is indirect evidence that Sedna may have a moon. The researchers hope to check this possibility with NASA's Hubble Space Telescope. Trujillo has begun to examine the object's surface with one of the world's largest optical/infrared telescopes, the 8-meter (26- foot) Frederick C. Gillett Gemini Telescope on Mauna Kea, Hawaii. "We still don't understand what is on the surface of this body. It is nothing like what we would have predicted or what we can explain," he said. Sedna will come closer to Earth in the years ahead, but even at closest approach, about 72 years from now, Sedna is very far away--farther than Pluto. Then it will begin its 10,500-year trip back to the far reaches of the solar system. "The last time Sedna was this close to the sun, Earth was just coming out of the last ice age. The next time it comes back, the world might again be a completely different place," Brown said.